≪Tail cactus≫, referring to the characteristically thin and elongated stems of the genus. Genus of shrubby plants with fine and long prostrate or semi erect stems, usually little branched, using the surrounding vegetation for support. Stems slender and ribbed, reaching up to 4 m long, with papillose or tomentose epidermis. 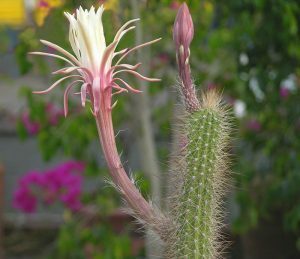 They are monomorphic, juveniles and adults identical (dimorphic in Acanthocereus). Roots usually tuberous or napiform, sometimes enormous. Spines finely aciculate, mostly tiny, sometimes appressed against the stem. Flowers diurnal or nocturnal according to species, self-sterile, rather large, with long and fine floral tube with bristles or spines, mostly whitish to off-white, sometimes red or pale pink to purple, pollinated by Sphingideae and hummingbirds. Fruits egg-shaped, elongated or pear-shaped, juicy, scarlet with red pulp, with bristles and deciduous spines. Seeds ovate, black, of rough appearance. Often difficult to see in its natural environment except when flowering or fruiting, the genus Peniocereus often grows on limestone or sandy soils, alluvial plains, also on limestone outcrops, shady cliffs, hills, in deciduous woodlands, among shrubs and bushes, in coastal areas near oceans (P. marianus), from sea level up to 1500 m in altitude. It often uses the surrounding vegetation (Larrea divaricata, Prosopis glandulosa) as protection and support. Mexico (Baja California, Chihuahua, Coahuila, Durango, Guerrero, Jalisco, Michoacan, Morelos, Nuevo Leon, Puebla, Sinaloa, Sonora, Zacatecas), USA (Arizona, S. New Mexico, S. Texas).